THIS IS AN AUCTION FOR A SIZE 12 Ish REGENCY FLORAL DRESS JACKET COSTUME THEATRE JANE AUSTIN EMPIRE LINE. It is approx a size 12 with a armpit to armpit measurement of 19.5 inches so about a 39 inch bust. It is fully lined through the body of the dress and jacket but the sleeves of the jacket are unlined. I think the main fabric is what we used to call georgette. It is like a stiff chiffon. ANY QUESTIONS PLEASE ASK BEFORE BIDDING. I AM HAPPY TO COMBINE POSTAGE ON ITEMS PAID FOR TOGETHER. Medieval Dress for re-enactment in a Dark brown Wool Size 10. 23” sleeve from shoulder to cuff. 16” across shoulders. Blue Spencer Jacket | Regency | Empire Line | Costume | Fancy Dress. Condition is Used. Dispatched with Royal Mail 2nd Class. Blue Spencer Jacket handmade for a theatre production of production of Pride and Prejudice. Perfect for a regency style ball or picnic for costume parties or dressing up. Should fit a size 10-12, made from a dark blue blended wool and fastened in the centre with a chrome button. The Spencer Jacket was originated by Princess Diana's distant relative, Earl Spencer. This adaptation for women was based on the regimental jackets worn in the Napoleonic era. This is a handmade theatrical dress for the Tudor Period. Ideal for school play or Tudor fancy dress. 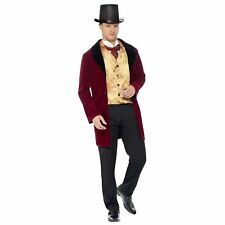 The main fabric is burgundy cotton velvet with white lace trim at the collar and cuffs. It has over laid white cotton fabric to create the slash sleeve. It has contrast stitching. The dress fastens with a zip down the right hand seam. The neckline is a shallow v. The dress is 58" long from the shoulder to hem. Regency Style gown in a mid green cotton with pale green ribbon trim. The gown has puff sleeves. This is a ‘round gown’ it pulls over the head and is adjusted with drawstrings at the neckline and a ribbon sash at the empire for an assured fit. Regency Gown Size 18. Handmade gown in hand block printed 100% cotton. The gown has a mock apron front and buttons at the back. Lovely light floaty fabric. Dispatched with Royal Mail 1st Class signed for. The bodice fastens at the back with lacing, similar to a corset. The bodice laces up at the back similar to a corset so is easy to adjust the size. It also has the red trim around the waist which flatters the shape. The dress is hand sewn and has beautiful sequin detail. This is a Victorian Ladies Black Dress. There are areas all over the dress that need to be sewn. I think it's a cotton blend dress, but I cannot be sure. (probably fairly authentic). and couple of repairs to shoulder and side. The bodice is well fitted and laces up at the back similar to a corset so the size is adjustable. There is loads and loads of fabric in this dress, especially in the skirt as it was made for a dancer to wear. This gorgeous gown is a beautiful deep purple with white embroidery, white insert down the front of the skirt, and white lining inside the cuffs of the sleeves. The dress has contrast stitching. The dress fastens with a zip down the right hand seam. Hoop-skirt is NOT included (as seen in picture) pearl necklace also not included. Bought this dress last year for a production and then didn't end up needing it, so I have little information/specifics about the dress. Woollen dress with detachable sleeves. lace up front. Linen look cotton dress. sleeves designed to hang down from elbow. (very authentic). fabric faded unevenly. Long T shift like outfit. beige linenlike heavy fabric. armpit to armpit 65 cm. 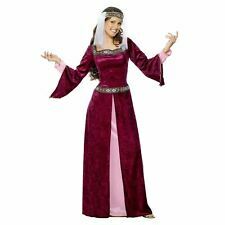 Lovely high quality ex-theatre purple velvet medieval dress and matching headdress, around size 14. In great condition. Bust: 44’ Waist: 36’ Ideally for party, theatre, schools etc. Look at my other listing for another great dress. This stunning gown is mainly soft flowing velvet, with a brocade section down the front. The oversized hood is velvet and lined in brocade. The brocade fabric is non-stretch. Seriously though, it is a beautiful dress, ideal for Gothic parties, balls, proms and any other special occasion! Empire Line, Regency 2 layer Dress. At the front a ribbon lace attaches the inner and outer layers together. The Empire line on this one does not tighten under the bust, but around it. Because it does lace at the back at this position you can as was the fashion, push your bust up and it will be kept in place (that is hence the elongating of the lace holes) so may need re-enforcing this area if that is how you would want to wear it. The gown was made using the Laughing Moon size 16 pattern. I’m a size 14 but as you need to wear at least a knee length full petticoat (chemise) under this dress, I oversized it to accommodate the extra layer. Lovely late Victorian outfit (skirt and jacket) 5m of fabric in skirt alone!! Worn once as a guest at Victorian/steampunk themed wedding. Worn over steel boned underbust corset (supplied), laced to 36". Buttons on jacket have good room to be moved, so alterations easy for perfect fit. Bustle pad supplied with it. Any questions please ask, and I will try my best to answer. Please note: this is a very heavy outfit and that is reflected in the postage. Here I am selling a Regency evening Canezou. Faux silk lined in cotton. sleeveless Spencer jacket. Most colours are available, please enquire :) Made to your measurements! Message me your sizing from the detailed chart pictured after purchase and allow 3-4 weeks delivery. One Ladies Toga fancy dress costume. Brand New. One size. Includes robe with shawl, belt & headpiece. 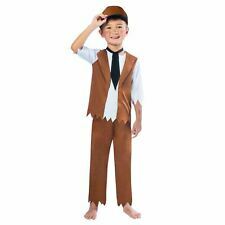 One Men’s Caesar fancy dress costume. Brand New. One size. Up to 44 inch chest. Includes Toga with drape, headpiece & armbands. Regency Style White /blue And Orange Floral Gown With Matching Reticule. Regency Style gown in white with blue and orange floral design. The fabric is a white Viscose. The gown has puff sleeves. It fastens at the back bodice with tiny buttons and has a blue ribbon sash. These aprons and head dresses are made from plain white Polyester cotton. 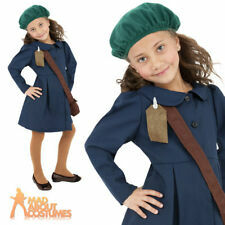 Original vintage handmade costume for a girl. Pretty dress with sequin detail . Lined with a cotton. Some loose sequins & marks as shown. Regency style gown in grey floral fabric. The gown has puff sleeves. It fastens at the back bodice with tiny button. The gown is lined in cotton. Not your size?. they are not like off the peg UK sizes. Regency Style gown in a dark peach faux satin. The gown has puff sleeves. It fastens at the back bodice with tiny buttons a’. The gown is fully lined in peach cotton. Not your size?. they are not like off the peg UK sizes. Grey Georgian court dress, very well made with lovely detailing all over and great fabric. Dress has a 38" bust and 34" waist, so a very useable size. Please note that the costume is pictured WITHOUT any sort of hip pads/hoops underneath (nor are there any included in the sale) - it would look amazing with something like this worn underneath, that would give the typical Georgian shape to the dress. This is a hire quality item, Georgian period is always popular for balls, theatrical and private hire. Auction is for overdress,matching skirt and fabric choker only. Regency Style Dark Olive Pinafore Gown With Chemisette. The chemisette is a peach floral lawn cotton with a ruffle collar and real shell buttons. The gown has bell has a green sash at the empire line and the back skirt is pleated. The bodice is lined in cotton. The gown will have short puff sleeves and fasten with buttons down the back and the skirt will NOT have a train. Unless you let us know differently of course. Professionally hand sewn and designed by myself - I have over 8 years experience in period dressmaking and have been greatly inspired by the tv period dramas of Jane Austen. My design has been to create beautiful Regency replica gowns that look and fit like your real clothes.